Sade Jones – Women In Jazz Association, Inc.
A native of Brooklyn, NY, Ms. Jones received most of her training at various NYC dance classes including Alvin Ailey and Broadway Dance Center. As an undergraduate of William Smith College, she minored in Dance and Social Justice. She performed works by Afro-Caribbean dancer and choreographer Chris walker and represented her school at ACDFA. In her junior and senior years, Sade went to Minneapolis to join the Ananya Dance Theatre becoming part of their touring cast. In summer 2012, she attended the complexions Dance Company Summer Intensive in NYC. With 13 years of dance training, Sade’s fierceness emerges when she uses dance to communicate the social agenda of her people. 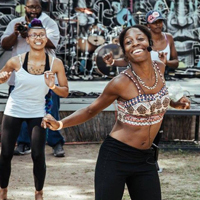 She is a freelance performing artist and choreographer in the Austin arts scene, Founder of Ashe Academy, and dance instructor at Texas Empowerment Academy. She was awarded “Best Movement” for the play, “For Colored Girls Who Have Considered Suicide When The Rainbow Is Enuf”, by the 2012 Austin Critic’s table Awards, and “Best Supporting Actress” for h er performance as “The Woman In Green” by the Austin Theater Examiner Awards 2011. She is currently a psychology M.A. at the University of Texas at Austin. A former dancer of Ballet East Dance Company of 5 years, she proudly joined Lotus in May 2015 as a pioneer performing artist in it’s first founding season.